RAPAPORT... Sotheby’s has unveiled a rare white diamond that, it claims, is the only known round brilliant-cut diamond over 100 carats possessing the highest cut, color and clarity grades. Sotheby’s Diamonds, the group’s retail boutique, revealed the 102.34-carat, D-color, flawless stone to mark the first anniversary of its salon on London’s New Bond Street, the auction house said Thursday. The polished diamond — which is available for private purchase, rather than at auction — originated from a 425-carat rough that De Beers unearthed in Botswana. Diacore, a South Africa-based manufacturer, spent six months cutting and polishing it in Johannesburg and New York. 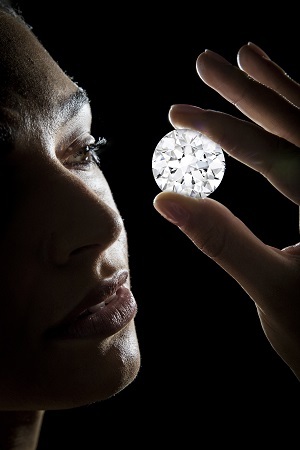 The round shape is the most sought-after for colorless stones, as it gives the most “light and life,” Sotheby’s said. However, in auction history, not even one of the seven 100-carat-plus, D-color diamonds that have sold was brilliant-cut. Large, round-brilliant diamonds are rare because cutters generally try to maximize carat weight when working with the rough. That usually means choosing a fancy shape such as cushion, emerald or pear, the auction house explained. “In the course of my long career, which has brought me close to some of the greatest stones the earth has ever yielded, I have not encountered anything quite like this,” said Patti Wong, founder and chairman of Sotheby’s Diamonds. “With its outstanding weight, its perfect color, clarity and cut, it is a masterpiece of nature brought to life by human hand, blazing with a brilliant firework-like display of almost every color on the spectrum — mesmerizing to behold,” she added. The diamond is on view to the public until Friday at Sotheby’s galleries on New Bond Street.